When you’re living in a small space, or share a kitchen, ideas about how to live and eat well using one appliance are always welcome. Here’s another. The price of good slow cookers has been dropping in recent years, and a small slow cooker will now cost you no more than £20. And anyway, it’s not all about money. It’s also about time: how many people are leaving for work at 6 o’clock in the morning and not seeing home again until after half past nine? A slow cooker, which uses less power than conventional methods for any given meal, is a way around both problems. A slow cooker meal can take 8 hours to cook, and the slow cooker will thereafter keep it warm until you are ready to eat. Furthermore, slow cookers work particularly well with cheaper cuts of meat, slowly breaking down the fibres until your pork, or beef, or chicken, or lamb, is meltingly tender. From a purely health-related point of view, it’s worth noting that slow cookers keep the moisture in the food far better than other modes of cooking, keeping vitamin and mineral loss to a minimum. 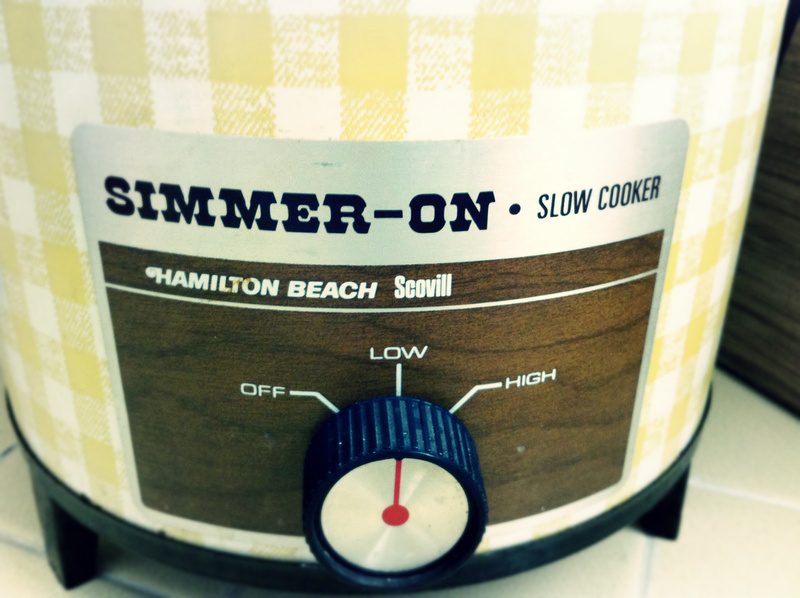 A slow cooker should not be treated – at least at the outset – as a “set it and forget it” machine, but given its versatility, buying a timer plug or extension and learning the foibles of your own machine and your favourite recipes for it may well leave you with a situation where you can indeed set the machine before leaving for work, knowing you’ll have a delicious meal to come home to. With slow cooking, focus on stews, soups, curries, pot roast and whole chicken (which can itself then feed you for the best part of a week in a variety of ways, and open the way to some extraordinary stock. Apartment Therapy’s “The Kitchn” blog has a wide range of starter recipes and tips for slow cooking with some gesture at style. Here’s a chap with views on how best to cook rice. He and his pals refer to “chicken-bone broth” which seems to be what you and I call ‘stock’. "That discipline, therefore, which corrects the eagerness of worldly passions which fortifies the heart with virtuous principles, which enlightens the mind with useful knowledge, and furnishes to it a matter of enjoyment from within itself, is of more consequence to real felicity than all the provision which was can make out of the goods of fortune." "But we hope, too, that through all the noise and excitement you'll glimpse a single golden thread of purpose - the idea of Jerusalem - of the better world, the world of real freedom and true equality, a world that can be built through the prosperity of industry, through the caring nation that built the welfare state, through the joyous energy of popular culture, through the dream of universal communication. A belief that we can build Jerusalem. And that it will be for everyone."